Happy Saturday! 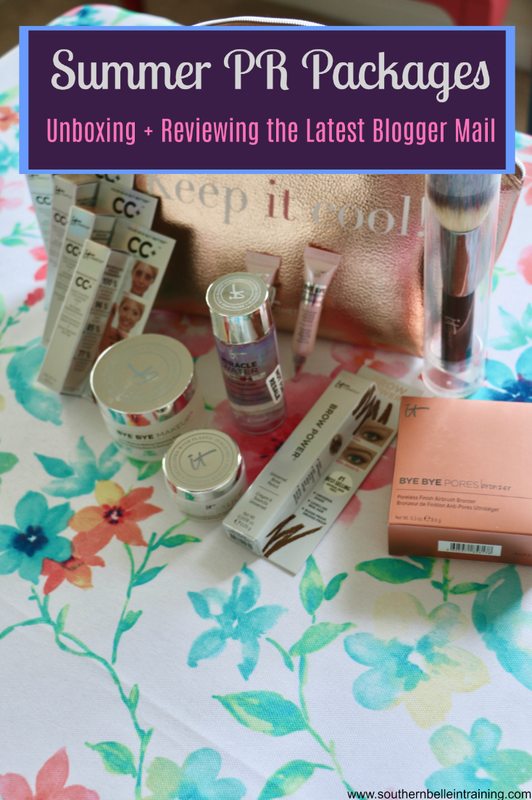 Popping in today to share my latest PR beauty package unboxing and reviews, as well as some fun beauty picks from the Nordstrom Anniversary Sale. If you're looking for more NSale content- you can check out my first Nordstrom Sale post from Thursday! A double dose from one of my favorites, IT Cosmetics, will get today's beauty package reviews started! I first got into using products from IT Cosmetics a couple years ago, and my love for their products has only increased with time. IT also sends really generous influencer packages out throughout the year, and I'm excited to share what I got in both of these! 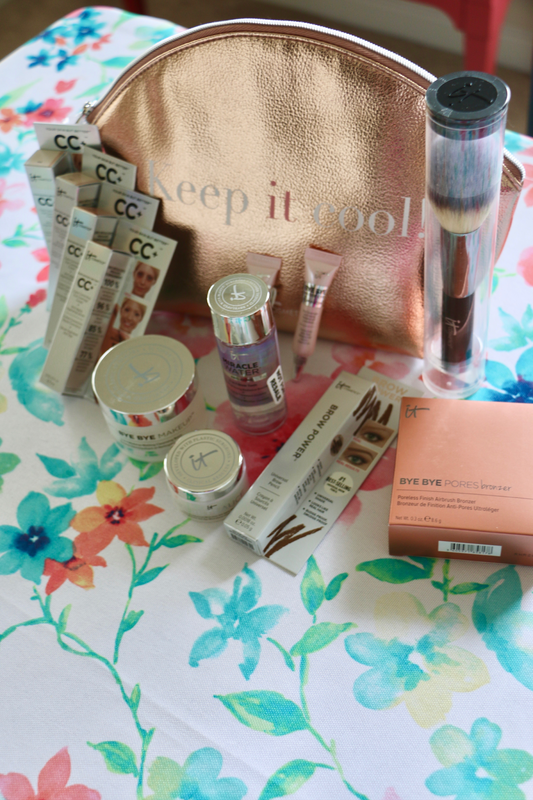 The first one, which came to me in late spring, was a cute makeup bag filled with travel sample sized items of a lot of their best sellers, like the CC Cream, Bye Bye Makeup removing balm, and the Brow Power pencil! There were also a few new goodies that I hadn't tried before. The second package is what they sent for the 4th of July! 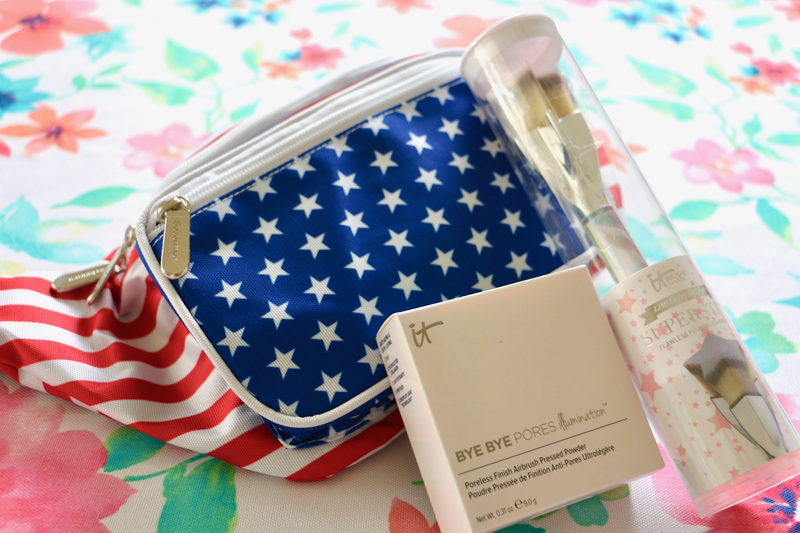 I love the star shaped makeup brush... is it totally terrible that I was most excited for the patriotic fanny pack? I totally wore that all day on July 4th and the following weekend on a DC day trip- ha! Next up are a few things I received from a totally new-to-me beauty brand! 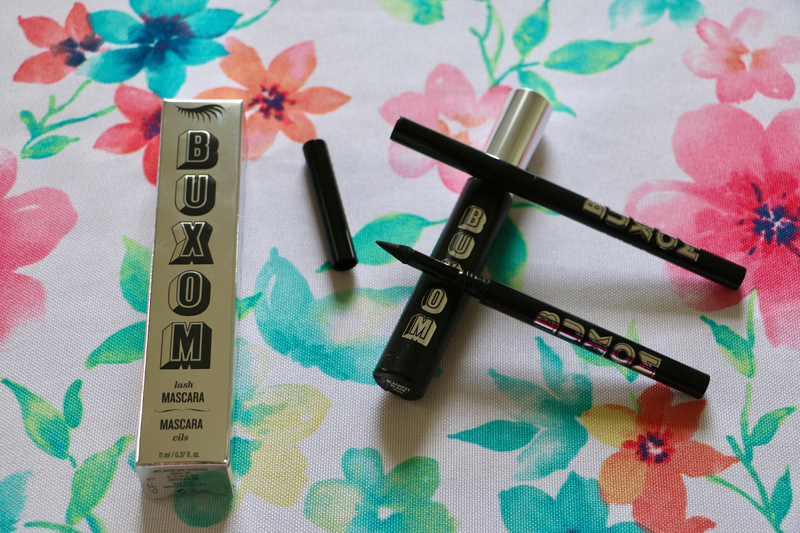 I'd heard of Buxom Cosmetics before and seen it sold at Sephora, but had never tried any of their products. I received the lash mascara and two shades of the SexySmoky kohl eyeliners. I've now been testing all the products for a few weeks before writing this blog post, so I could really give y'all an honest review. Unfortunately- the mascara isn't my favorite. It's not necessarily a "bad mascara," it just gives lashes a super natural look. I prefer clumpier and bolder mascaras since I like a heavier lash look for everyday, so it wasn't my favorite for my makeup style. But if you prefer more natural lashes, this could be a good one to check out! I do like the kohl eyeliners, especially in shade. I recently stopped wearing liquid winged eyeliner everyday, and have switched to a lighter brown eyeliner (and not winged) for weekday and church makeup looks. This one is great! The last beauty related post I'll be sharing today is from one of my favs- Avon! I feel like I say this every single time I write one of these posts, but they send the most generous influencer gifts. The latest package that I received had several of their face masks to try, and they also sent the softest towel and a fun personalized terrycloth headband- perfect to use with the masks for a night of pampering! Doing a face mask is one of my favorite ways to de-stress, so I cannot wait to keep trying all of the new ones they sent. And one last package that's not beauty related. Had to share my latest earrings I received from Sugarfix by Baublebar of course! 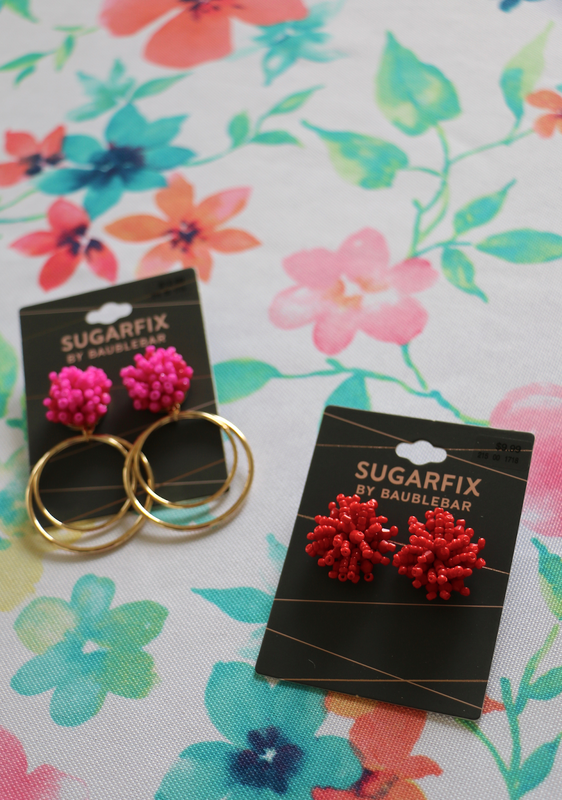 If you aren't familiar with Sugarfix, it's the Target exclusive Baublebar jewelry line- everything is super cute and very reasonably priced. Loving both of these beaded earrings from my latest Sugarfix package- I wore the red ones on July 4th for watching fireworks! Midweek Ramblings is coming up tomorrow on the blog! Thank you so much for sharing your review on the Avon masks! I've been debating trying them as a most cost-friendly mask option! So many cool products! I've been loving the eye cream from IT Cosmetics! Love your pr package hauls! That fanny pack is too cute- perfect for an American themed bid day haha! Haha I actually love AVON products! Loving those It Cosmetics products, they have the best things! Wow! So many great products! Now I’m ready to go shopping! I want to try all of those it cosmetics products!! I haven't bought new makeup in so long! 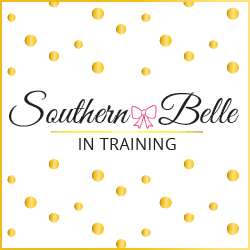 What fun products! This has given me more ideas for cosmetic products to get soon.